Basements are usually thought of as the least pleasant area of a house—for humans. But not so in the eyes of a snake, and that’s partly why you may have snakes in the basement. Impacted by habitat loss and attracted to suburban yards by the many prey animals feasting on pet food left outside, spilled birdseed, and unsecured trash, snakes naturally begin looking for nearby shelter, and often find ways into basements. Food and shelter found together is a winning combination for any animal, and getting inside a home is relatively easy for a snake. Some only need an opening of 1/8 inch or so—that small an opening may be found around a basement window or door, around unsealed wires or pipe conduits, or in cracked cement steps or porch seams. Remember that snakes perform a helpful ecological role in your surrounding area. For this and other reasons, when evicting a snake from your home, use a non-lethal approach, followed by steps (described below) to prevent future access. Snakes often follow the scent trail of rodents into basements and crawl spaces. If you are at all unsure whether the snake is venomous, contact your local animal control agency, state wildlife agency, local police, or fire department for help in capturing and removing the snake. If you know a snake is in the house, but you don’t know where: place a heating pad set on low on the floor of the basement or crawlspace. Place an old pillow case on the heating pad with the open-end fashioned so it is obvious to the snake, and easy to enter. The warmth and opportunity for cover will attract the snake, making capturing the snake easier for whoever comes to help. If you are capable and so desire, once the snake is in the bag, twist it closed and take the snake outdoors for release. 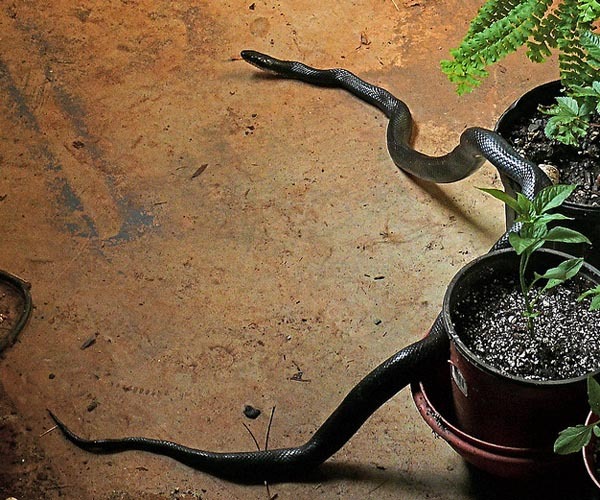 If the snake is small or coiled: gently place a waste basket or bucket over the snake and put something heavy on top to keep the snake there until someone from your local animal control can come to remove and release it. If the snake is large or not coiled: use boards or boxes to try to confine the animal to one room or to a corner of a room until help arrives. If you know you have a snake, but are unable to find and capture the snake, follow the inspection and exclusion steps below. If you do not currently have a snake inside, and merely want to prevent one from entering, eliminate the “one-way door” step below and simply complete the inspection and sealing steps. Inspection: Search for cracks or holes 1/8 inch or larger at the foundation, examining cracks around basement windows and doors, unsealed wires or pipe conduits, and cracks in cement steps or along porches where they are attached to your home. Sealing: After identifying all possible snake entrances, seal all but the one that seems most likely to be the main one, which is where you will attach a one-way door (described below). Use heavy-gauge wire mesh or match the original building materials. After giving the snake a chance to exit by following the steps in “One-way door” (see below), seal the main hole as securely as the others. One-way door: To make a one-way door for a snake to exit your home, roll a 10-inch-long piece of aluminum window screen into a cylinder. It should be a little wider in diameter than the main hole you have left open. Insert one end and suspend the other end a few inches above the ground, which will enable the snake to safely exit, but not return. Leave the one-way door in place for one month before sealing the hole, or until late spring if it is already fall. Snakes (and mice) can get into your basement though gaps where pipes enter the house. Don’t forget to assess your yard for things that may have attracted the snake. Are there hiding places for snakes and their prey, such as piles of debris, rocks, or wood? 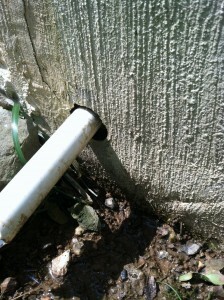 Are there cracks in cement porches or walks, or access to space under a shed floor? Is pet food left out, spilled birdseed left on the ground, or garbage left unsecured? Things that attract prey animals make your yard an appealing place for snakes to hunt and your home a convenient place to seek shelter. Reduce your yard’s appeal to snakes and you’ll reduce the likelihood of snakes entering your home.